It has never been an easy ride for African-American people and for those growing up in the 1950s it was particularly hard. There was a lot of racial tension and discrimination to contend with and many found it extremely hard to cope with it. While some integrated, somehow, into predominantly white neighbourhoods, others found themselves segregated, both socially and economically. This happened to some degree to this poet’s family. Born in October 1948 with a birth name of Paulette L. Williams, she was fortunate to be part of an upper middle class black family in Trenton, New Jersey. Her father was a surgeon in the US Air Force and her mother had a dual career as educator and psychiatric social worker. Her difficulties really started when, at the age of 8, the family moved to St Louis which was, at that time, a racially segregated city. Shange found herself at an all-white school and suffered greatly from racist attacks, both verbal and physical. Such treatment will have had a lasting effect on her and, indeed, she grew up as a strident black feminist, writing poetry about the struggles of black people living in a predominantly white environment. Shange was lucky though to have a loving and supportive family around her and they encouraged her artistic side. It helped that the Williams home was often host to such luminaries as musicians Dizzy Gillespie, Miles Davis and Chuck Berry, along with the renowned African-American Civil Rights activist, journalist and educator W. E. B. Du Bois. Having somehow survived the traumas of school in St Louis, Shange completed her high school education back in New Jersey. She went on to a college education where she graduated in American Studies, following that up with a Masters from the University of Southern California in Los Angeles in the same subject. College was not, however, a happy time for Shange. She suffered from depression having been married and then quickly separated. She attempted suicide at the age of 23 having come to the conclusion that her feelings of bitterness and alienation about her life in general were too much to bear. She recovered though and decided she didn’t want to be Paulette Williams any more. 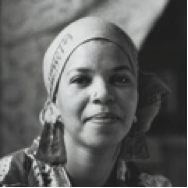 She adopted a name of Zulu origin and became known as Ntozake Shange. 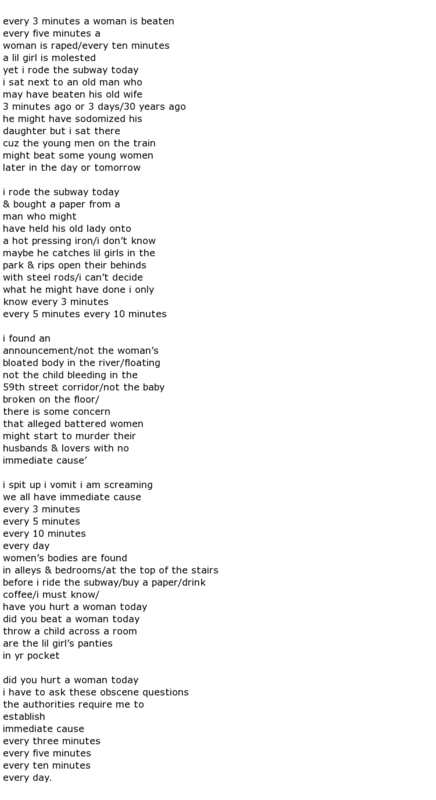 The translation of Ntozake is “she who has her own things” and Shange means “he/she who walks/lives with lions”. Perhaps seeing herself as being part of a pride of lions boosted her self esteem and gave her the motivation to write a lot of poetry from then on. Moving to the Brooklyn district of New York in 1975 saw her output of work covering black feminist subjects increase and the awards soon followed. With a backward glance to her suicidal period she wrote a play called For Colored Girls Who Have Considered Suicide When the Rainbow Is Enuf and this won three separate awards. It had started out as a 20-part poem and Shange adapted it into a stage play which was eventually seen on Broadway. In 2010 the story was made into a movie called For Colored Girls. Another piece of work emerged from her real life experiences – Betsey Brown, a novel about an African American girl who runs away from home.